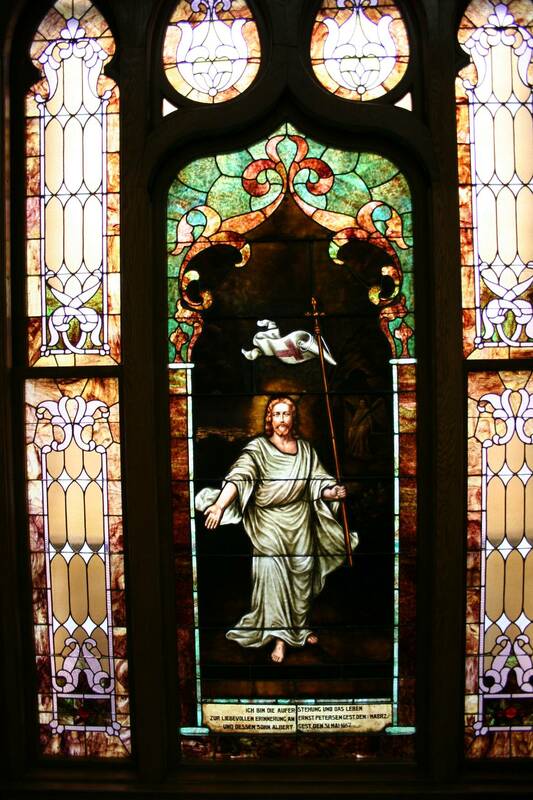 “I am the resurrection and the life.” A stained glass window in the Trinity Lutheran Church sanctuary, Faribault, Minnesota. Minnesota Prairie Roots file photo. Wishing you, my dear readers, a most joyous and blessed Easter! SOMETIMES IT IS the unexpected which brings joy. I did not expect my nearly 82-year-old mother to effuse such enthusiasm over dyeing eggs on the Saturday before Easter. But she did when I told her days in advance of a weekend visit that I would bring hard-boiled eggs to color in addition to a cooler full of food for our meals. 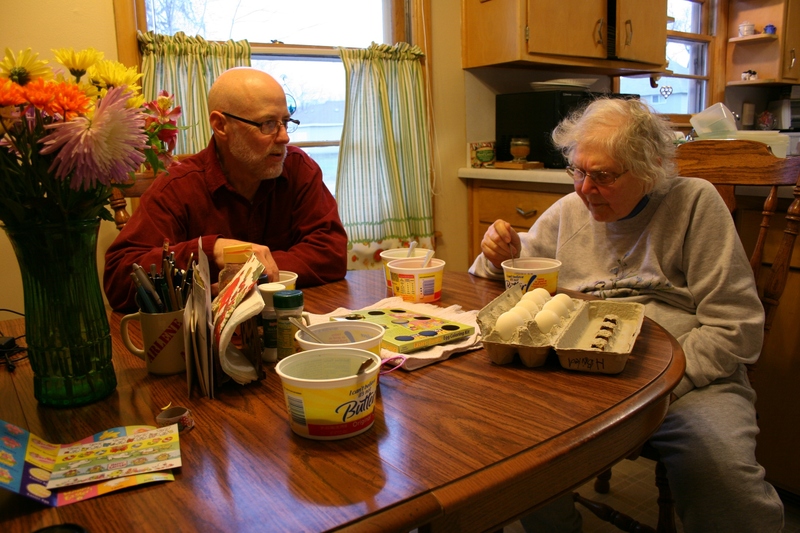 “I haven’t dyed eggs in years,” she responded, giddy like a kid with anticipation. Her enthusiasm was precisely what I needed as I had been feeling a bit melancholy about my first Easter in 28 years without any of my and my husband’s three “kids” around. We could easily have skipped the egg dyeing. But as I rummaged through my mom’s kitchen cupboards looking for containers in which to dye the eggs, I was glad I’d brought those eggs. Like an eager child, Mom was already struggling to open the tightly-glued package of Easter egg dyes while I counted out six empty “I can’t believe it’s not butter” containers for the dye tablets. 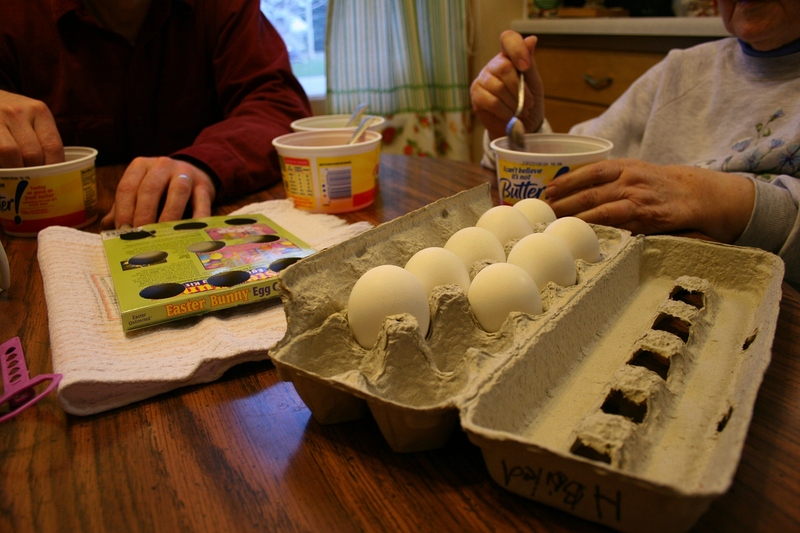 My husband and mom dye eggs at her kitchen table Saturday evening. Eventually we settled at her cluttered kitchen table, bowls of dye before us, spoons and tongs at the ready. Not to worry about spilling on the table, she assured us. So we didn’t. But we didn’t. Spill that is. Stirring and dipping and dyeing and trading colors. Rather we laughed and talked and dipped eggs in dye and stirred and waited and mused that the purple was more pink than purple, the red dull, the blue especially eye-pleasing. 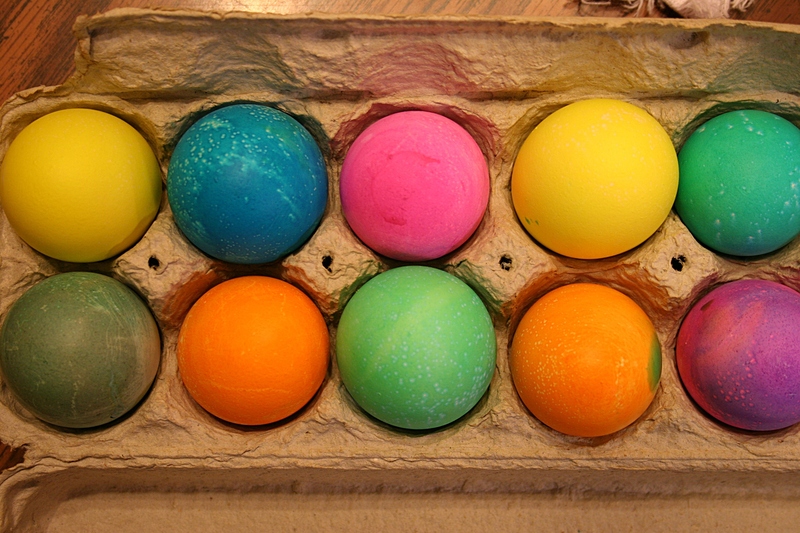 Ten of the eleven eggs dyed. And in the process I realized that long-standing childhood holiday traditions matter. Even to an 82-year-old.